Homebodies who like to hide in invincible shells. Only problem: too many attacks will cause the shell to pop right off, leading to blushing and potential bruises. 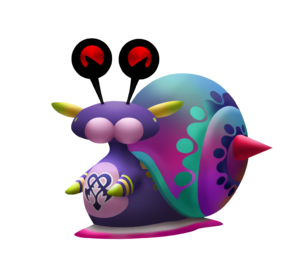 The Escarglow is a Dream Eater that appears in Kingdom Hearts 3D: Dream Drop Distance. The Escarglow is a snail-like Dream Eater. 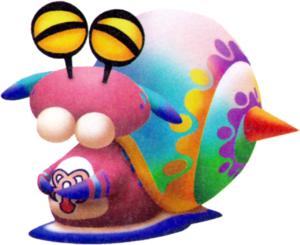 The Escarglow's name is a portmanteau of "Escargot" (Fra: "Snail") and "Glow", while its Japanese name consists of "Denden", short for "Snail" (でんでん虫, Denden-mushi? ), and "Cargot", short for "Escargot". Its Japanese name is also a pun on "Electricity" (電, Den?). These names reference the Escarglow's "electric snail" design. As a Spirit, it has a dark pink head with blue ears, white balls and two black antennas leading to eyes, that change color depending on its disposition. It has a dark pink body with a white chest, where the Spirit emblem is. It has a colorful shell with purple and orange patterns and an orange horn on each side. Its purple body and head can change color by using Paint Guns. As a Nightmare, it has a dark purple head with yellow ears, light purple balls, and two black antennas leading to its red eyes. It has a dark purple body with a light purple chest, where the Nightmare Dream Eater emblem is. It has a colorful shell with dark purple and blue patterns and a red horn on each side. Several Escarglow arrive with a multitude of other Spirits to welcome Sora when he returns to Traverse Town after finishing the Mark of Mastery exam. ↑ 1.0 1.1 Becomes available when in Blindsider disposition. ↑ 2.0 2.1 Becomes available when in Snail Support disposition. The Escarglow Recipe can be purchased from the Moogle Shop once The Grid has been entered. The Escarglow can be created through seven different recipes. The third recipe is a rank C recipe that has a 70% chance of success. The fifth recipe is a rank C recipe. The sixth recipe is a rank B recipe that has a 40% chance of transforming from Toximander. This page was last edited on 31 March 2019, at 10:58.